Micromax launched a budget Dual Sim Android smartphone named "Micromax Smarty A65". It comes with 4.3 inch TFT screen with the resolution of 480x800 pixels. It runs on Android 2.3.5 Gingerbread completely out date one and it powered by 1 GHZ ARM CortexA5 processor. The phone has 2GB RAM and 190 MB internal storage but it can be extended up to 32 GB with the use of external memory. Micromax Smarty has 2MP rear camera and VGA front camera. But no video call support, because this phone does not support 3G network. It supports only 2G network and Bluetooth, WiFi and USB 2.0. GPS is also not available on this model. It comes with some pre-installed apps such as Hookup, M!Zone , M!Store, Cricket Fever, Whatsapp and Facebook. Micromax Smarty A65 available in Indian market now. Flipcart.com listed this device and priced for Rs. 4999. 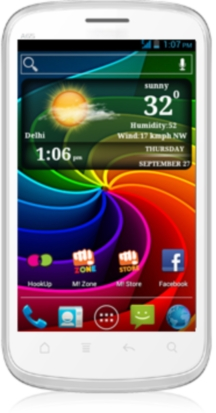 Check information on official Micromax Smarty A65 Page.